The collection was donated to the University Archives by Stuart Watson in February 2010 (Accession number 2010:008). The Stuart Watson Photograph Collection is organized into one series – Photographs; which is arranged alphabetically. 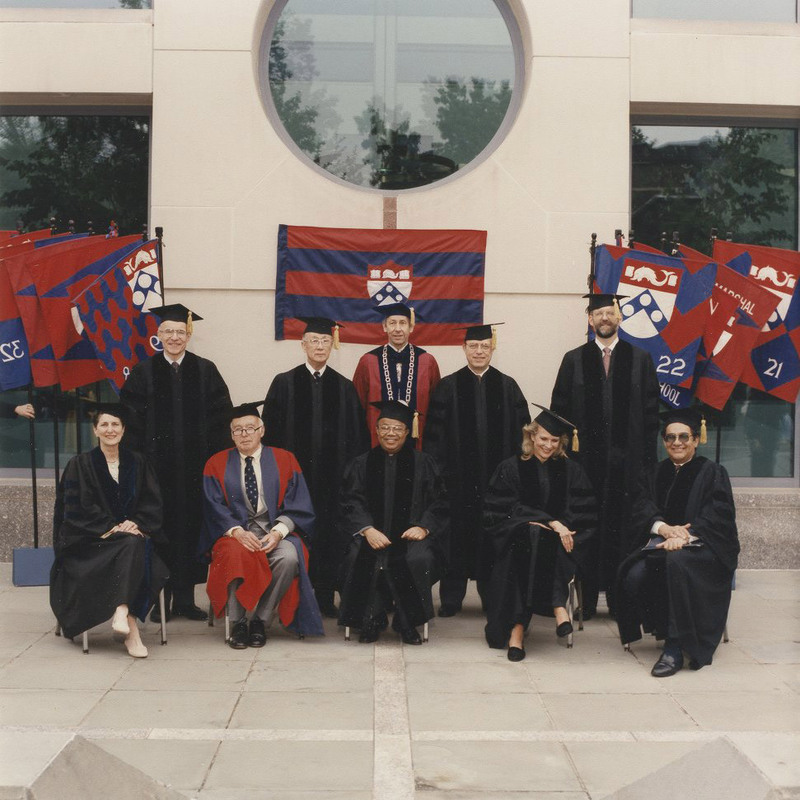 Stuart Watson is a professional photographer who was contracted to photograph various events at the University of Pennsylvania during the 1990s. This included commencements, campaign kickoffs, and dedications. The Stuart Watson Photograph Collection of University Events is comprised of images taken by Watson at various events on campus during the 1990s. The bulk of the collection consists of negatives, though photographic prints and contact sheets are among the contents (specific formats are noted in the inventory). Identification of individuals in images is minimal. School of Arts and Sciences. Wharton School. Alumni Affairs Office. Anita Hill at Penn [color 35mm negatives] n.d.
Class of 1943 Breakfast at Museum with Lucy Hackney [color 35mm negatives] n.d.
Class of 1967 at Museum [color 35mm negatives] n.d.
Class of 1967 group shot [BW Print] n.d.
Library Tokisha / Honda Check Presentation [BW 35mm negatives] n.d.
Library Tokisha / Honda Check Presentation [BW contact sheets] n.d.
Library Tokisha / Honda Check Presentation [color 35mm negatives] n.d.
Library Tokisha / Honda Check Presentation [color contact sheets] n.d.
Memorial Service Office of the Secretary [color 35mm negatives] n.d.
Midpoint Dinner [color 4×5 negatives] n.d.
Penn Medicine Mildred Cohn [BW 35mm negatives] n.d.
Penn Medicine Mildred Cohn [BW contact sheet] n.d.
Savings Bonds Breakfast [BW 35mm negatives] n.d.
Savings Bonds Breakfast [BW contact sheets] n.d.
Wharton Snider Dinner [color 35mm negatives] n.d.
Wharton Unknown Event [BW 35mm negatives] n.d.